Premium coffee beans, roasted and cold brewed in triple distilled Irish whiskey for 7 days. The result is a uniquely spirited and balanced drink like no other. For those who enjoy good coffee and good whiskey, a new drink from Bayview Beverages could hit the spot. It’s called Black Twist and it is a 25 per cent ABV (alcohol by volume) craft spirit drink that blends single origin Kenyan Arabica coffee and Irish whiskey. Black Twist has been created by Conor Coughlan who has brought his background in chemistry and food science to bear on his love of artisan coffee and an interest in brewing techniques. Black Twist, which has been two years in the making, is the result. The product, which is allowed to mature for seven days before the coffee is filtered out, has just been unveiled to the Irish on-trade sector. It comes in a 700ml bottle and is being pitched as a premium product. This will be reflected in the price, which is not yet finalised. 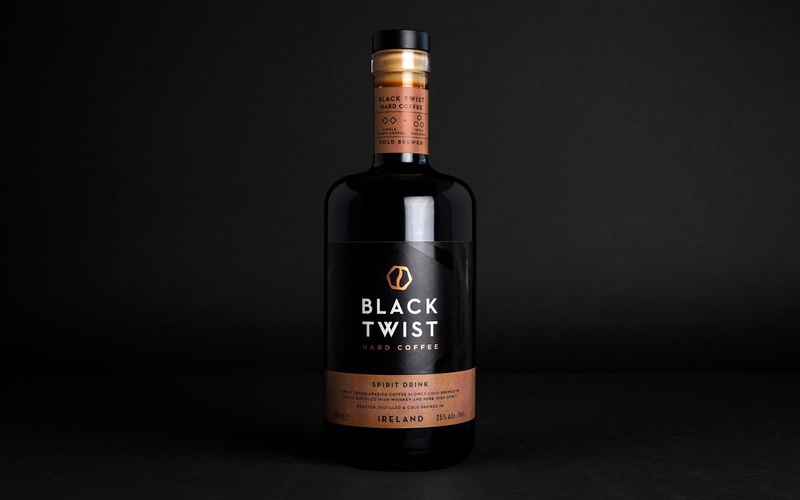 Black Twist will be produced in Ireland under contract. Coughlan joined the Kerry Group from college as a new product development graduate and stayed there from 2008 until 2015 when he began working on the idea for Black Twist. Coughlan describes his innovation as “hard coffee” as in coffee brewed in hard liquor to produce a less sweet and more authentic taste. “Recent trends in both coffee and spirit consumption are moving away from sweet products to real flavours driven primarily by millennial consumers,” he says. “This in turn has been driving the growth of premium craft products in both the coffee and whiskey sectors globally. Coughlan says he was very interested in how the cold brewing process was becoming increasingly popular in the coffee sector internationally. “This is where coffee is slowly brewed in water at room temperature, often for 24 hours or more. It involves a completely different set of chemical reactions to hot brewing and gives a different drink with a more nuanced flavour. To date roughly €130,000 has been invested to bring the product to market and this has been a combination of personal funding and support from Waterford LEO and Enterprise Ireland. Coughlan is a graduate of the New Frontiers programme for start-ups and recently participated in Bord Bia’s Foodworks initiative for new product development.